12:30p.m.—As work winds down on two lightning-caused, tundra fires in southwest Alaska, firefighters are bracing for fires in other parts of the state that are drying out. Red Flag Warnings for high fire danger have been issued today for the eastern Alaska Range, Deltana and Tanana Flats, and the Upper Tanana Valley/Fortymile country due to high winds. Gusts of 55-60 mph are expected in the flats of the eastern Alaska Range and 30 mph gusts are forecast for the Fortymile country near Tok. Firefighters in Fairbanks on Monday acted quickly to catch a fire that appears to have been started by a lightning strike during a storm the day before. The 10-acre Standard Creek Fire was reported by a Division of Forestry prevention unit on patrol in the area just after 2 p.m. about a mile off Standard Creek Road, a logging road about 15 miles south of Fairbanks. Air tankers and a helicopter equipped with a bucket quickly responded and dropped retardant and water on the fire while waiting for ground troops to arrive. A load of smokejumpers was dropped on the fire and immediately began cutting a saw line around the fire, which was actively burning in black spruce. The White Mountain Type 2 Initial Attack Crew and Fairbanks Type 2 Crew joined the effort and crews worked late into the night to get saw line cut around most of the fire before bedding down at around 2 a.m. Monday. The plan today is to demobilize the smokejumpers while crews continue monitoring line around the fire while working the inside of the perimeter. Crews expect to get saw and hose lines around the entire fire today and plan to have it contained before the end of shift. Smoke from the 10-acre Standard Creek Fire about 15 miles south of Fairbanks is seen in this photo taken Monday afternoon. Division of Forestry photo. There are only three other fires currently being staffed in Alaska and crews are conducting mop-up operations on each. The last two crews working on the 25,260-acre Bogus Creek Fire in southwest Alaska will be released from that fire today. Fire managers flew over the fire on Monday and observed moderate fire behavior with some creeping and little open flame. The Pioneer Peak and Chena interagency hotshot crews worked to secure line on the eastern flank of the fire. Two smokes were identified on the western side of the fire on Bogus Creek. A small squad of the Chena crew was put in place to work the smokes in coordination with bucket work from a helicopter. The Bogus Creek Fire was the biggest of about a dozen fires in southwest Alaska that were caused by lightning strikes on May 31. Another one of those fires, the 14,827-acre Whitefish Lake 1 Fire, was completely demobilized on Monday and placed in monitor status after firefighters spent a week suppressing it. A Temporary Flight Restriction remains in place over the Bogus Creek and Whitefish Lake 1 fires. For more information on temporary flight restrictions go to http://tfr.faa.gov/tfr2/list.html. 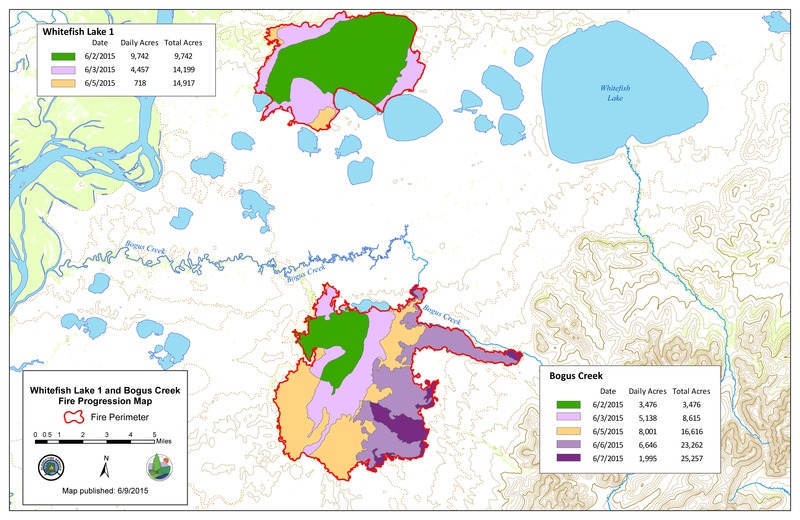 A progression map that shows the daily growth of both the Whitefish Lake 1 and Bogus Creek fires in southwest Alaska. Fire managers are planning to pull all personnel off the 249-acre Innoko River Fire east of Grayling on Wednesday. That fire was started by lightning on June 3. On Monday, the 15 personnel working the fire completed mopping up to 200 feet in on both sides of the perimeter and gridded both black and green areas for heat. The plan is to consolidate all supplies today and pull hose for demobilization Wednesday. 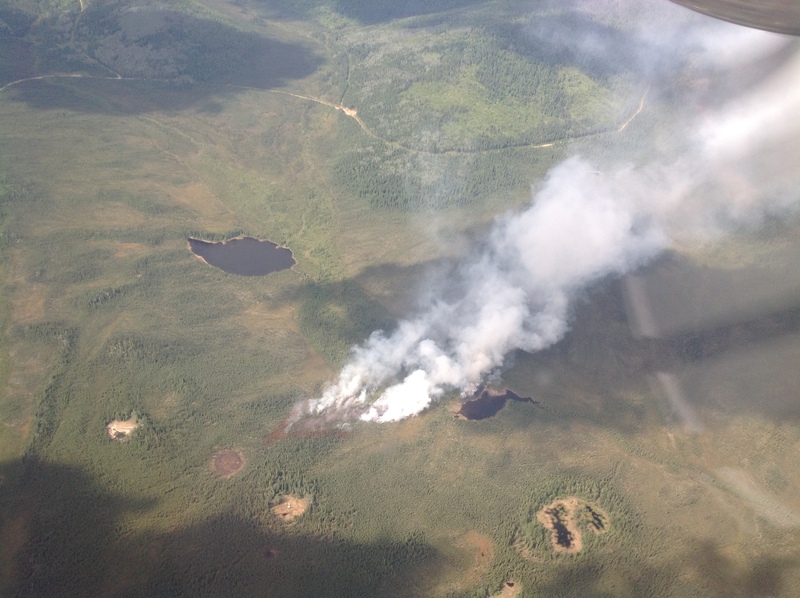 The only other fire staffed in the state is the 2,902-acre Seventymile Fire near Eagle in eastern Alaska. The 28 personnel remaining on that fire, which includes the Midnight Sun Interagency Hotshot Crew, continued to work hot spot areas on the east and west flanks identified from an infrared flight on Sunday. The fire received light precipitation overnight Sunday and fire activity on Monday was described as minimal and smoldering in the duff. To date this season, 234 fires have burned a total of 50,822.2 acres in Alaska.